New Zealand's preference for electing female Prime Ministers (far in advance of other nations) makes her a gift for astrologers. New Zealand’s preference for electing female Prime Ministers (far in advance of other nations) makes her a gift for astrologers. Using all the asteroids of modern astrology, it is easy to pinpoint symbols like Venus, or Minerva when looking at elections. 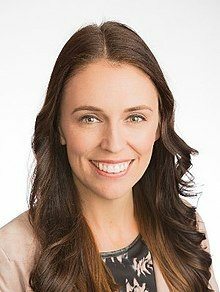 Jacinda Ardern won office on 23rd September 2017 and took on her job as P.M. on 26th October. New Zealand astrology is clear to see even if she has different ‘birth’ charts. I was lucky enough to be invited to speak at the Astrology Foundation of New Zealand recently in their stunning Auckland home, and we had a long discussion about the New Zealand ‘birth’ horoscope. How does new Prime Minister Ardern’s victory show up? It falls in line with a strong Capricorn pattern across several New Zealand astrology charts. 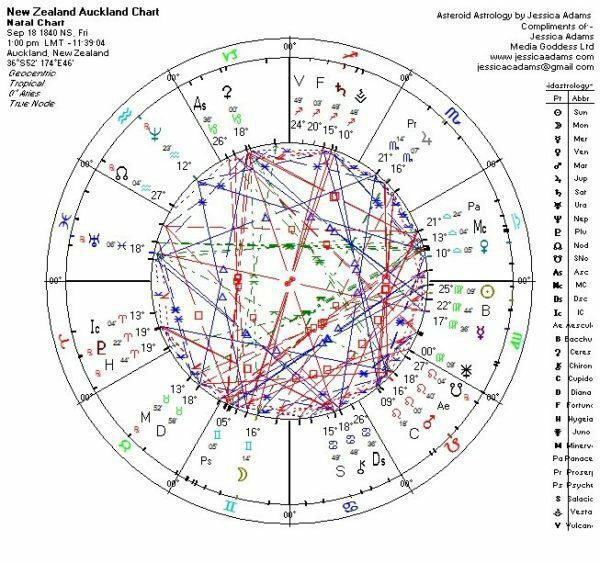 There are four possible astrological charts for New Zealand, and two in particular have turned out to be very good predictors of everything from earthquakes, to politics. They are 13 years apart, but the national horoscopes set for the constitution on January 17th, 1853 and the Waitangi Treaty with the Maori people on February 6th 1840 have a lot in common. The latter was signed in the afternoon, so the chart is set for 1.00pm. The former has no recorded time, so 00.00am is used. You can see Venus in Capricorn – the woman at the top – showing clearly in the Waitangi Treaty chart. This is a good description of New Zealand’s crusading feminism, and shows both Helen Clark, the first female Deputy Prime Minister in the country’s history, and also Jenny Shipley, the first female Prime Minister, together with Jacinda Ardern (left). Using the Natural House System and the full asteroid family tree of modern astrology, we also get the planet Ceres in Capricorn (another female symbol) and Bacchus as well. The latter is associated with grapes and vineyards so we get New Zealand wine. She’s an ambitious and much-awarded wine producer and exporter. Ceres is the powerful producer goddess associated with agriculture. The New Zealand coat of arms shows us a goddess as well so this pile-up of astrological archetypes makes great sense. There is a lot more going on in this chart (and in New Zealand) than these simple truths, but more on that in a moment. Look at the second chart, set for the arrival of the constitution, below – to see the similarities. 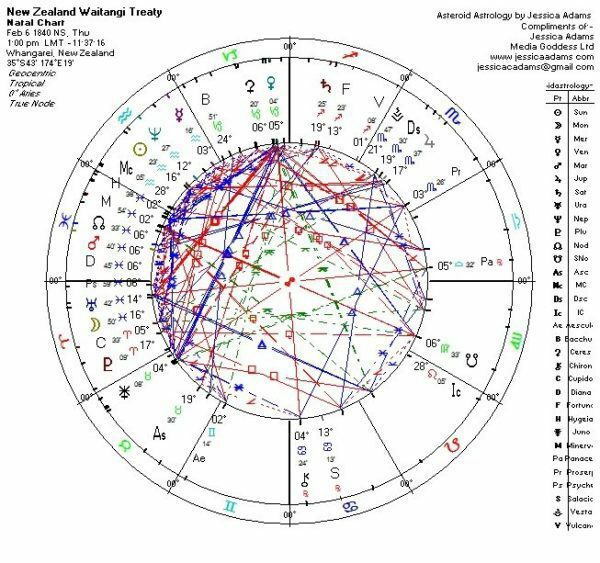 The New Zealand astrology chart set for the Waitangi Treaty. 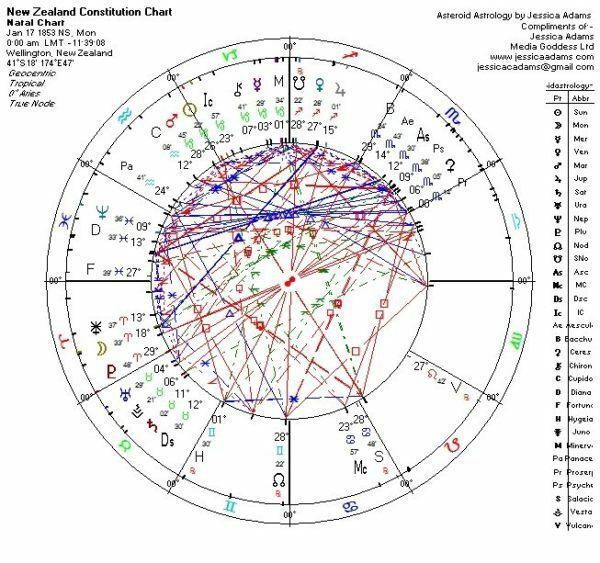 The NZ astrological chart set for the constitution. Do we also find female Deputy Prime Ministers and Prime Ministers in the chart set for the constitution? Yes. Minerva is in Capricorn, also in the sign of ambition and people at the top. 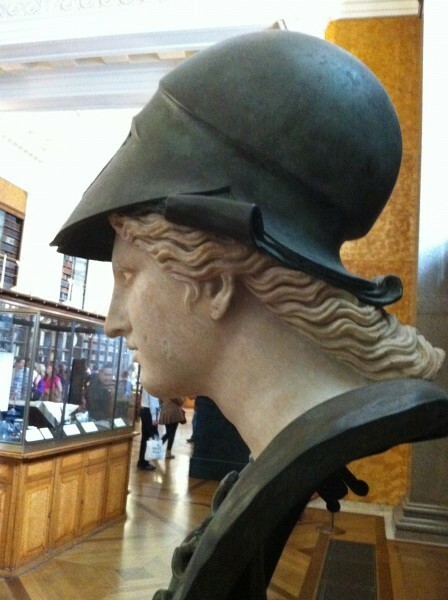 Minerva is an important asteroid in modern astrology. She is the daughter of Jupiter. She is a symbol of wisdom. She is traditionally shown with an owl by her side. The Romans knew her as her father Jupiter’s counsellor and advisor and she was often seated by his side in their temples. These female symbols are stacking up! WHAT HAPPENED TO THE NEW ZEALAND HOROSCOPES WHEN WOMEN MOVED INTO POWER? 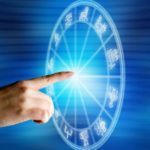 What happened to New Zealand (in both horoscopes) when women moved into power in 1989 and 1997 and again in 2017? You might expect an outer planet to make an impact, because they move very slowly, and when they reach the same degree as anything in a national chart, it tends to be historic. Groundbreaking. Unforgettable. You might also expect those transits to involve Capricorn, which describes the people at the top. Traditionally, this is the Prime Minister, the Deputy Prime Minister, the President, the Queen and so on. 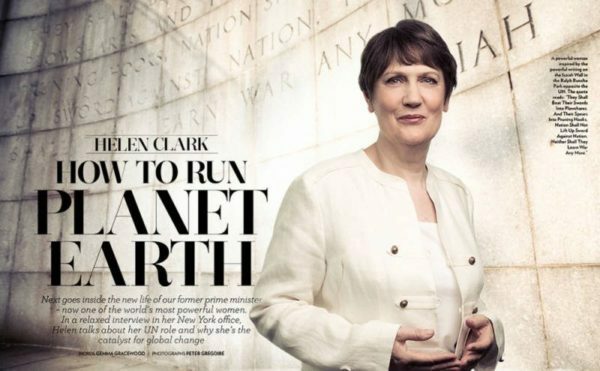 In 1989 when Helen Clark became the first woman to be appointed Deputy Prime Minister of New Zealand, Uranus moved across 1, 2, 3, 4 and 5 degrees of Capricorn. Uranus is the planet of revolution. Thus, Uranus was conjunct New Zealand’s Minerva at 1 Capricorn that year, triggering the chart we have set for the constitution. Helen Clark was playing Minerva. Also in 1989, as Uranus passed 5 degrees of Capricorn, it made a conjunction to Venus in the other chart – set for the Waitangi Treaty. So here, Clark was acting out the role of Venus in her country’s horoscope. Uranus is about radical change. It is associated with liberty and also liberation. Having seen these early degrees of ambitious Capricorn work in both NZ horoscopes in the year Clark made history, we might also expect the pattern to turn up in the years that Jenny Shipley and Jacinda Ardern both became Prime Minister. It does. Jenny Shipley came to power in 1997. Remember Venus at 5 Capricorn in the Waitangi Treaty horoscope? Uranus was at 5 Aquarius, making an exact semi-sextile that year. Jupiter was at 5 Aquarius as well. Saturn was at 5 Aries, forming a square. Pluto was at 5 Sagittarius, making a semi-sextile. In the chart set for the constitution, it is Mercury at 3 Capricorn, in the sign of leadership, which is under exact transit. 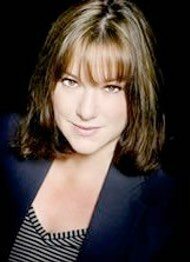 Jenny Shipley found herself in the top job, in the same year that Jupiter at 3 Aquarius, Saturn at 3 Aries, Uranus at 3 Aquarius and Pluto at 3 Sagittarius all made exact aspects. 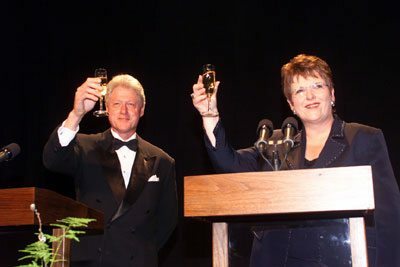 Here is Bill Clinton, below, sharing a toast with Shipley that year. She was acting the role of Mercury the messenger. The woman behind the microphone. The Prime Minister in front of the world’s media. When Jacinda Ardern won across 22nd, 23rd, 24th September 2017 we found Hygiea, the asteroid of protection, at 5 Capricorn. Bacchus, the asteroid of celebration (and the N.Z. wine industry) was at 5 Scorpio. Venus was at 6 Virgo, Minerva was at 6 Sagittarius and Hygiea later moved to 6 Capricorn. 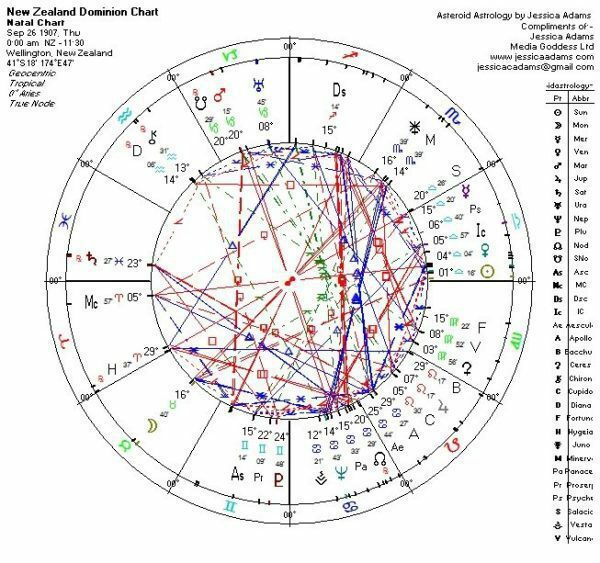 Venus at 5 Capricorn and Ceres at 6 Capricorn in the Waitangi chart were thus triggered when Ardern became P.M. When she took office across 25th, 26th October 2017, the Moon moved through Capricorn as an entire sign. In the N.Z. Constitution chart the Sun at 26 Capricorn was exactly transited by Jupiter at 26 Libra and Chiron at 26 Pisces on 23rd September 2017 when Ardern won the election. Do you remember the November Supermoon? The Full Moon in Taurus, on November 14th, 2016 was very important to the future of the New Zealand economy. We are approaching a cycle (from May 2018) that will transform the world economy and New Zealand saw a small preview of the future, back in November 2016. This memorable Full Moon (Supermoon) in Taurus saw the Sun in Scorpio opposite the Moon in Taurus at 22 degrees. 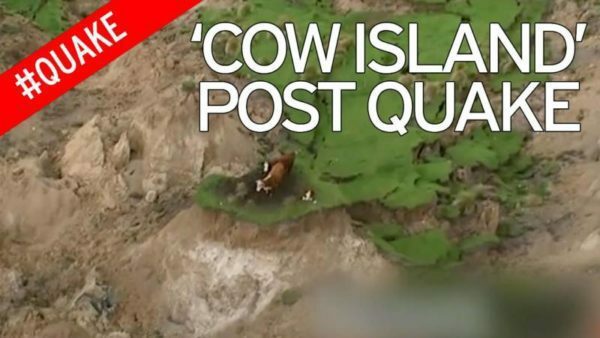 On the same day, the nation suffered an earthquake that drew more attention than usual – because it famously stranded cattle, cutting them off from the country and the rest of the world. Image – Twitter. Astrology works on synchronicity. The cattle were a clear symbol of Taurus, to any astrologer who was watching. New Zealand does in fact have major Taurus signatures in both charts – and of course, she is well-known for her dairy industry. 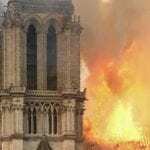 The Supermoon and cattle stranding occurred very near the victory of Donald Trump in America, and the New Zealand dollar fell dramatically after this occurred. We had a good discussion about this at the Astrology Foundation in New Zealand, in their lovely Auckland meeting rooms. The symbolism of the cows, cut off from the rest of the world – and the ‘coincidence’ of the dollar slide, seemed to point to both American politics and climate change as key factors in what is undoubtedly going to be a massive shift for the NZ economy, from 2018. Juno is Jupiter’s wife and a symbol of commitment. Of course, the chart itself, was a land commitment made between Maori people and the new arrivals! We don’t have a clock time for the first signature, but history tells us that signing began that afternoon, so a Taurus Ascendant is clear. Note the fact that Uranus and Juno have ended up at exactly the same position. This means that 4 Taurus is a hotspot in New Zealand’s destiny. Vesta is Saturn’s daughter and a symbol of male-female imbalance, which is interesting. Saturn is, of course, the hard karma for New Zealand – the tough realities of her economy. I happen to believe that the universe talks to us, and she talks in unforgettable images, which go around the world on social media, as well as the regular media. That photograph/clip of the cattle cut off, right on the Taurus Supermoon, is definitely whispering about the future of NZ, in the context of her dairy and beef exports, the realities of climate change, and the American trade partnership. Of course, November was also a key month for the Brexit process and Her Majesty the Queen (a Sun Taurus) has her head on New Zealand currency. In May and June 2019, Uranus will move to 4 Taurus and Venus is also at 4 Taurus, near Sunday 19th May. (Allow across May 18th, 19th, 20th for the world to catch up with itself). That is highly significant. We also have Chiron circling 4 Aries, which forms a semi-sextile to both Juno and Uranus itself, in the two New Zealand charts. Shrinking herds or shrinking industry? Shrinking trade terms in the wake of Brexit? A new American trade deal? Uranus in Taurus. Girl versus Bull. NBC News. The last time Uranus was in Taurus in 1934 it marked the end of a dairy price-fall. How will Brexit Britain and America treat New Zealand and her butter and cheese exports in 2019? 1934 is also the year that the Reserve Bank of New Zealand was established as the nation’s central bank. Up until that time New Zealand’s monetary policy had been set in the United Kingdom. The special trade relationship between NZ and the UK fell apart in 1973 when Britain joined the European Economic Community. In May 2018 we’re looking at nothing short of a revolution. 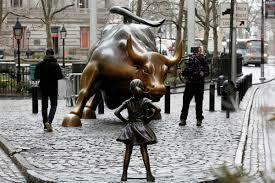 The Wall Street Girl (left) may be an early sign of this for New Zealand. Uranus is the planet which times rebellion, leading to new freedom and independence. 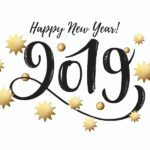 The specific windows in time, when Uranus passes the crucial 4 Taurus position, include May 20th to June 8th, 2019 and as the planet retrogrades, October 19th to November 12th, 2019. There is a final pass over 4 Taurus from March 9th to 28th, 2020. I am a huge fan of Auckland and have always enjoyed the comments and letters from my New Zealand readers, at The Star Times, when I used to write a weekly column there, and more recently, in The Australian Women’s Weekly (NZ Edition). Over to you. What do you think these historic passes through New Zealand’s economy sign, Taurus, will mean for the country? 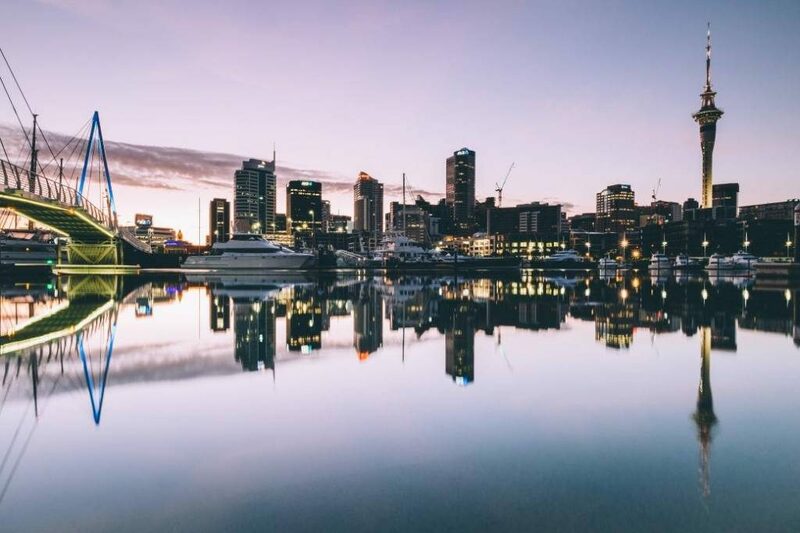 Between May 20th and June 8th, 2019 – and then October 19th to November 12th, 2019 and March 9th to 28th, 2020, New Zealand will undergo an economic revolution which directly affects the Reserve Bank and also her dairy and beef, cattle industry. This was hinted at back in November 2016, when American politics, Brexit and also climate change became issues. The economic revolution to come, will give the nation a clear choice. She can either select independence, or perhaps have it forced upon her. This independence will be confronting, as the radical changes of Uranus always are, but from May 2019 to March 2020, the country will find exciting new economic freedom she has never known before. The value of the New Zealand dollar on world sharemarkets will spring shocks and surprises, throughout this period. I thought I would finish with two more charts showing different versions of New Zealand astrology. Again we have that Capricorn signature. The Dominion chart shows Uranus at 8, Mars at 20 and the South Node at 20. The Auckland chart has goddess Ceres at 18 and the Ascendant at 26 Capricorn. The Sun is of course at 26 Capricorn in the Constitution chart so right on the other Ascendant! Going back to the Ardern win again we find the asteroid Diana (independence) at 20 Capricorn and Mercury at 20 Virgo very close to the voting and result across September 22nd, 23rd, 24th, 2017. That’s right on Mars at 20 Capricorn and the Node in the Dominion chart. The Auckland chart shows us the Ascendant at 26 Capricorn and on 23rd September that is where we find Jupiter at 26 Libra and Chiron at 26 Pisces making a point. Now look at the amazing match across Taurus-Scorpio 16 degrees in both charts. In the Waitangi chart, Jupiter is close at 17 Scorpio. Prediction! When Jupiter goes to 16, 17 Scorpio from December 27th 2017 to January 7th 2018, New Zealand is going to cut the deal of her dreams. 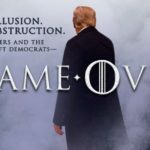 The pattern repeats in May 2018 – a shock for the world but a breakthrough for New Zealand. August, September 2018 complete the cycle and N.Z. will make or save a fortune. Let’s talk about that on Twitter. Thank you. New Zealand is very special. On this trip I bought two secondhand astrology books, and was given a third one free. I was given cake to take home. I was offered lifts. In short, there was nothing Auckland people couldn’t do, right down to the kind-hearted service in cafes! Let me look at the Canada chart now, in The Book of World Horoscopes by Nick Campion. We have a couple of charts, one set for 1st July 1887 at 00.00 LMT in Ottawa and another one set for 3rd July 1608 at 12.00 noon in Quebec. The former makes Canada a Cancerian and so does the latter! That fits. It’s an intensely patriotic country and has heavily invested in Maple Syrup, ice hockey, Mounties and other aspects of life which keep her quite separate from her dominating neighbour, the United States! Canada will be a major player in the huge world economic shake-up to come. In one chart she has Saturn at 17 Scorpio, Pluto at 15 Taurus (in the financial zones) and in the second chart she has Pluto at 1 Taurus and Jupiter at 10 Taurus. Watch what happens in May, June 2018 because this is a currency and economy revolution not seen in many decades. It will make this beautiful country far more independent. Cue – separation from the US dollar. I saw this link regarding a possible alternate time for Canada. Fern Mercier here from the AFI lecture last Sunday. Richard Paul in the 1970s did an enormous amount of historical research on the timing of the first signatures on the Treaty Of Waitangi . 10:17 am is the time AFI astrologers have been using since then. We have his research in the AFI library and I wrote an article in the Journal after a presentation in 2015 I gave on this chart. Richard also wrote in the Journal last year about NZ charts. The 10:17am chart gives an ASC of 23 degrees 25minutes Aries and 26degrees MC in Capricorn. Loved your talk and ideas Jessica! This is fantastic, Fern, thank you. It is wonderful to have 10.17am as the Treaty of Waitangi recorded time from Richard Paul and AFI astrologers. It’s not online so I didn’t find this the first time. Will now correct the chart and add to the story. 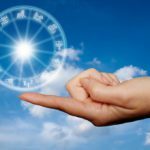 I look forward to any more info you may have on the New Zealand astrology chart Jessica, I am emigrating to New Zealand later this year, from London, and was very interested to read this article on your blog. Thank you so much. You will love the people in New Zealand, I think – make sure you pop into the Father Ted pub in Auckland to listen to the live music. I am putting a new chart with a verified ‘birth’ time for this country now and will update this post in a little while. I am so tickled that you did this, thank you so much! I’d be really interested to hear your thoughts on the CANZUK International campaign to allow free movement between NZ/Aus/UK/Canada: do you think this is likely to go through? And if so, when? I really hope so, that would present so many opportunities for work and travel! Fantastic question Claire and it will go through. In fact the new CANZUK will expand to include other places too, and even more intriguing temptations for travellers/migrants and in 2019 your shiny new passport details will allow you to do have the most amazing work or holiday opportunities. Why? Jupiter in Sagittarius. The pain of the old world dissolving will be replaced by a superior version in just two years. Hi Jessica. I saw this at the end of a story about banks looking at developing their own blockchain in a national business newspaper. “On May 8 and 9th some of the biggest names in the blockchain world will be in Auckland to take part in what is turning out to be one of the most exciting blockchain events in Australasia: the Blockchain NZ 2017 conference. 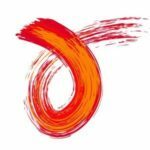 The event will have more than 20 international speakers, close to 500 attendees, and includes keynote presentations from Vitalik Buterin, creator of Ethereum (and a 2016 Fortune magazine 40 under 40 star) and Andreas M Antonopoulos, author of numerous blockchain/bitcoin books including Mastering Bitcoin and The Internet of Money.” So I wondered whether New Zealand becoming more independent is somehow linked to the new currencies. In addition, the country’s chief scientist last week put out a report strongly criticising the way the country has let major waterways get polluted – by dairy industry-aimed fertilisers – and demanded that action be taken. Probably this means herd size reductions as well as other measures. At the moment both the deputy leader of the government party, National, is female as is the deputy leader of the main opposition, Labour and the co-leader of the Green Party. But even though there is a female chief justice, very few women are leading businesswomen, which is a bit sad. That is so interesting about the alternative currencies being given a flying start in New Zealand. Thank you for letting me know. The report on the dairy industry runs parallel to that – so the two will be linked once Uranus goes into Taurus in 2018 and beyond. Independence is a lonely road, agreed, but it will also be very exciting for New Zealanders, who will find themselves in a unique position. 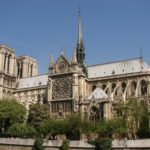 Sometimes in the middle of radical change you just have to adapt, quickly, and make it work – and I think that’s what will happen in this beautiful, unusual place. Women have indeed been quite prominent in New Zealand politics. New Zealand was the first country to give women the vote. And between 2005 & 2006, the top five political posts (The Sovereign, the Prime Minister, the Governor-General, the Speaker of the House of Representatives & the Chief Justice) were all simultaneously held by women. Hi Jessica, Really like the depth and detail to which you go when making predictions. And about countries too! Any thoughts on China? I will look at China next year when I have researched all the charts, thank you.